April 2, 2019 | -by: Kevin George. Take a minute, and think about that one email that made you want to click on the actionable button? What was so different about the email? What caught your eyes while reading that email? When your email offers some value to the reader, it does get the results you have anticipated. However, the real question remains how to engage people with the email you have sent, get them to read the content, and make them take the desired action? The answer to this question lies with the target audience or the person reading the email. You should understand what they expect from your email, and what exactly they were looking for when they subscribed to your emails. The first thing that you need to take into account before even beginning with the email marketing strategy is the subscriber’s expectation. Very clearly, the first expectation is the email being relevant to them. If you have been lazy enough not to check what the subscriber is actually looking for, when sending the emails, you are not going to be able to convert the subscriber. Give some importance to research when studying your target audience, and understand what exactly they looked at when signing up for your emails. If they were interested to buy a particular type of dress from your ecommerce store, then you should send similar products that would interest them. You could even send them discount coupons if you think that price was the factor that made them abandon the cart or not check any further on your site. Relevance should be visible through the subject line and the content. Make sure you don’t use a very irrelevant subject line, which is not the focus of the email at all. You may not get the open rates desired. The subscriber also expects the frequency to be set to their liking, and for the brand to ask them questions about what they expect from the emails, before actually signing up. Having decoded the subscriber’s expectation, it is time to understand how you live up to these expectations. How will you create one of those engaging emails that will direct the subscriber’s attention and make them want to convert? Having understood the subscriber’s perception of email that converts, it is essential for you to build an email marketing strategy around it. Let’s begin with the basics. The subscriber’s perception will help you define your goals better. For instance, who is the intended target audience and what do they expect from your emails? These questions, when answered, will help you get a better idea of what kind of emails you need to draft for the subscriber. Once this has been figured out, you need to identify what you want the user to do when they open the email. Do you want them to go and download your new app or read the entire article that you have carefully drafted for them? Finally, create the metrics to help you identify if you were able to achieve your campaign goals. Was there enough open rate for the email or did the readers download the resource you had promoted? You need to define these metrics for individual emails. The subject line should not be too long. Make it crisp for the end users. A subject line should not contain more than 30 characters. The reason being, your emails can be opened in the mobile devices as well, which can result in a part of the subject line getting cut, if it is too long. The preview text should be used whenever you have got something to say, and you are unable to convey it using the minimum characters provided to you. The preview text will help you increase the characters while keeping the subject line mobile friendly. FOMO is your best friend. If you don’t create a sense of urgency or, the fact that there is something the subscriber might miss out on if they don’t open the email, you might not enjoy the open rate you want. Make sure the subject line conveys urgency and is along the lines of the content. You can always ask a question in a subject line. It helps create a positive vibe and makes the user feel that you know them. It is the copy of the email that strikes the chord with the subscribers. The core message of your emails is the heart of the email marketing campaign you are planning to run. Here we will talk about the many ways in which you can work on an excellent copy for the email campaign you are planning. The content of the email changes with the type of email you are planning to send out. The welcome email is more like an on-boarding email for the subscriber, where they learn about your business and get to understand what value you will offer through the emails. The content should match what you are trying to convey. Whether you want to be more on the soft side or, you want to thank the person or, you want to be firm with the subscriber depends on the type of email you will be sending. Storytelling format is the best for the email copy you create. You should define a flow for the email so that content creation is easy. Make sure you have short paragraphs to describe and convince through the email. Finally, make sure you include one CTA that helps you convert the user, and achieve your goals. When writing the content for your emails, you can use the different copywriting techniques to get the best results. One such method known as Bucket Brigade is powerful as it makes use of specific keywords that are sure to draw the subscriber’s attention. Finally, personalize the emails for the end user. Use the first name when addressing the subscriber. Add a few other personalization elements through the email for best results. 1. 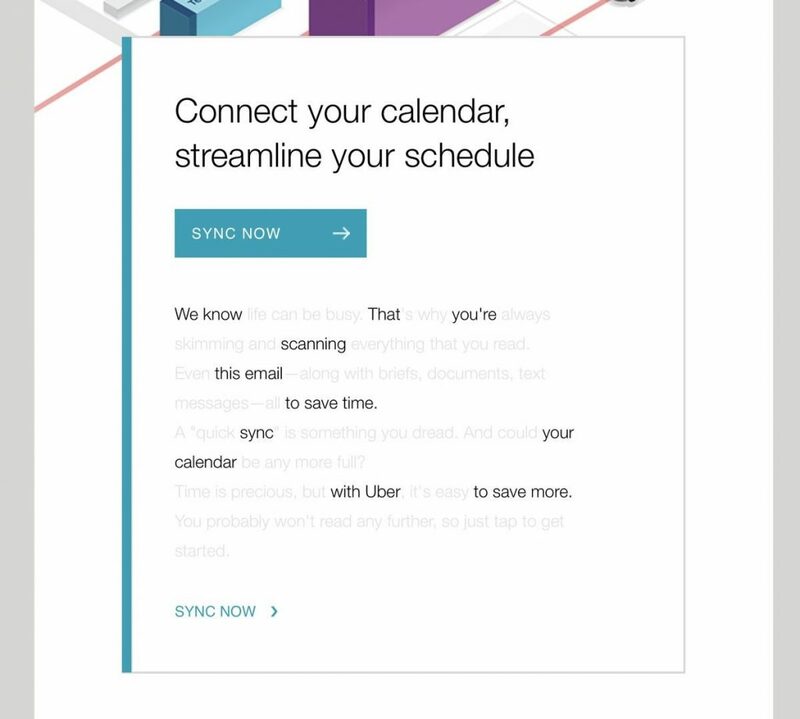 Uber’s Connect your Calendar campaign is an intelligent way of getting customers to read your emails, take action without using too many words. This campaign is a perfect example of concise content, well-defined flow and perfectly placed CTA that compels action. Almost every email from the brand tells a story and connects with the customer. 2. When Desiree Linden won the Boston Marathon 2018, Brooks Sports — the sponsor for the athlete decided to celebrate the partnership with an awesome email campaign. It was inspirational, added value to the subscribers and struck the right chord with them. What is most striking about the email is the CTA that draws your attention. It makes you check out Desiree’s gear, and that’s exactly the purpose of the email. To make your emails matter to the subscribers, and to maximize your conversions, you should be more relevant to the end users. You need to offer value to the users. If you don’t have anything to communicate or offer to the users, the email may not work for you. The subject line is an important part of the email strategy. You should use subject lines that communicate the email’s message and make the user open the email. Setting the goals before moving forward with the email copy and subject line should help you get the right copy out, and engage the customers with your emails.